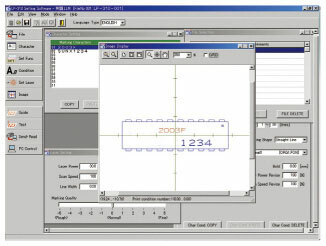 Basic functions, such as "lot number", "serial number", "date of manufacture", "counter" and "logo", have been adopted. This enables us to provide the product with an initial cost that is reasonable to customers who are worried about expenses. Because it has a compact size with the controller integrated in the main unit, it can be mounted vertically and at an angle as well as horizontally. This makes it easier to change from previous marking devices. Data such as the characters to be marked and their sizes can be set using a computer and then sent to the laser marker via a USB cable. The laser marker can store up to 120 types of marking settings (files). These settings can be read and marked when required. There is no need to keep the unit connected to the computer if the unit is running. The LP-300 series laser markers are the result of accumulated manufacturing experience and know-how from Panasonic Industrial Devices SUNX, and are designed to be easy to use in the same way as a printer. 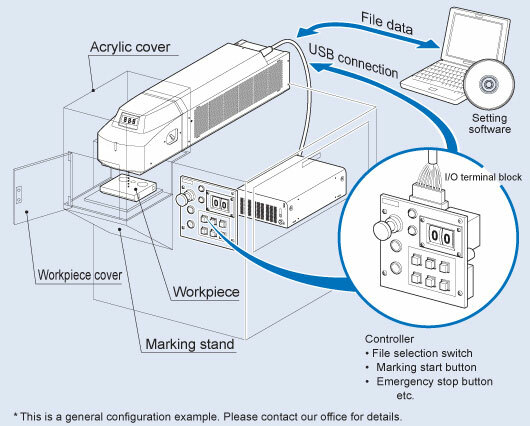 Marking systems that use the LP-300 series laser marker can consist of a laser marker unit, a computer for setting and administering marking details, and other peripheral devices such as those shown in the example configuration below.